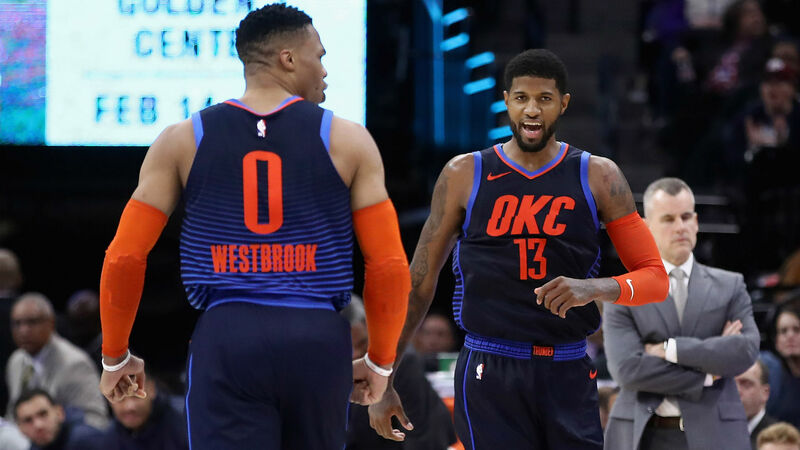 Oklahoma City Thunder star Russell Westbrook believes Paul George is the "frontrunner" for the NBA's Most Valuable Player Award. George is averaging career highs in points (28.7), rebounds (8), assists (4.1) and steals (2.3) for the Thunder this season. The five-time All-Star is shooting 45.4 per cent from the field and 41.3 per cent from three-point range. And Westbrook has endorsed George for this season's MVP following his 47-point triple-double against the Portland Trail Blazers. "The way he's playing [is] consistent," Westbrook – the 2016-17 MVP – told reporters on Wednesday. "To be able to do the same thing every night is not easy to do. "I think a lot of people around the world that don't play basketball, that don't play sports, don't understand what it takes to be consistent and get your mind right every night to be able to do something. George signed a new four-year, $137million contract with the Thunder in the offseason. The Thunder started Wednesday third in the Western Conference with a 37-19 record.